Staff photo by Steve Muscatello New Ulm Cathedral’s Chris Knowles drives to the basket agaist Sleepy Eye’s Frankie Trevino (5) during the first half Tuesday at CHS. 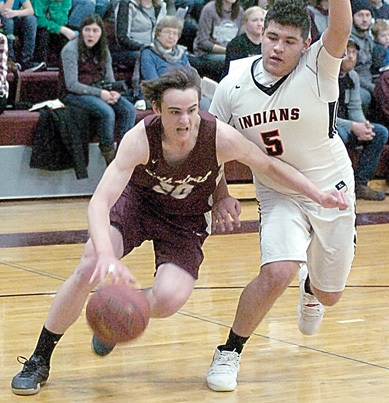 NEW ULM — Jon Zinniel scored 19 points to lead three players in double figures as New Ulm Cathedral improved to 9-4 in the Tomahawk Conference and 14-4 overall with a 66-50 win over Sleepy Eye Tuesday night. Chris Knowles added 14 points, Alex Hillesheim ended with 13 and Ethan Kirchberg tossed in 11. Hillesheim now needs 2 points for 1,000. Nathan Walter led the Indians (6-13, 4-7) with 15 points. Jose Ibarra scored 13 points. The Greyhounds, who play at Minnesota Valley Lutheran Friday night, broke an early 9-9 tie with a 20-4 run to grab a 29-13 lead on a basket from Kirchberg. The Indians cut the lead to 29-20 before a traditional three-point play from Chris Knowles and a jumper from Knowles saw Cathedral holding a 33-20 lead at halftime. Cathedral did have miscues handling the ball especially in the second half. Cathedral saw the Indians cut the lead to 44-37 on an Ibarra 3-pointer before the Greyhounds increased that to a 58-43 lead on two Zinniel free throws. The Greyhounds upped the lead to 61-48 on a Hillesheim free throw at the 3:01 mark and another Hillesheim free throw — at the 2:25 mark — had Cathedral in charge at 65-48 and Hillesheim at 998 career points. The Greyhounds tried to get the ball to Hillesheim, who was two points shy of 1,000, but Sleepy Eye elected to run down the last 1:39 to end the game which did not set well with Woitas. 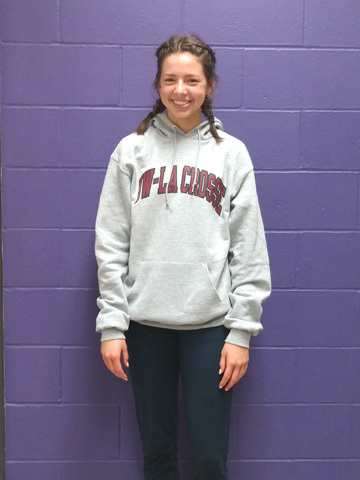 “He [Hillesheim] did a nice job of being unselfish,” Woitas said. “Towards the end of the game we tried to ge him the ball but Sleepy Eye Public cared more about not allowing him to get his 1,000th career than winning a basketball game. “We get MVL Friday and they are playing good basketball and our kids willl be excited to play. It is always a tough place to play at,” Woitas said.